The items from the kit are the wreath , deerhead, embossed background and die cut 'christmas'. When I was thinking of what to do with these items I saw the inspirational photo at Time Out and got inspired! I painted the deer head with 'blush' acrylic paint and added lots of fine clear glitter, I coloured the wreath with a very pale gold gilding wax. The stamped 'hugs' is by Avery Elle. I think this has quite a 'Disney' look that I quite like for a change! Great job with this one, Marina! I envy you -you were so clever to "separate" the big Merry Christmas- wording so you could get more use for it, I wish I would have thought of that! Looks great that the message is partly stamped, partly die cut. This has a very "fantasy forest"-feel, love it! Don't forget to link up to TIME OUT! I LOVE LOVE LOVE this. You used my favorite elements. The deer and that wreath are GORGEOUS!!! This is also very pretty. Plenty Christmasy even in pink. Love how soft and delicate this card turned out. Zooming in I see the glitter sparkle and fine golden touches. It's original and a beauty. I love these beautiful, soft colors for a Christmas card. Love the snowy, sparkly texture. Beautiful CAS design. Thanks so much for taking "Time Out" to play with our challenge! 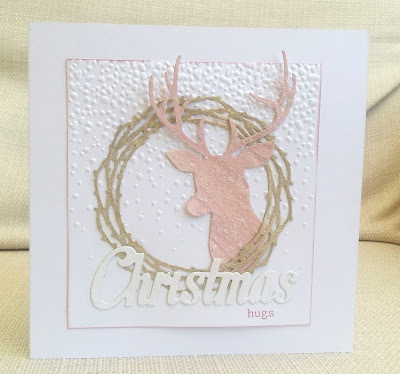 Thank you for sharing your beautiful card with us at Cardz4Galz, hope to see you again next time..
Love this soft color palette. Great take on the inspiration image. Absolutely gorgeous Marina ! I love the softness of your card ! Love how you played with the colours of the photo to make your Christmas card !Thanks for sharing and for the inspiration ! All of the delicate details on your card are so beautiful! Thanks so much for playing with us at Time Out! Congratulations Marina ! You really deserve it, your card is just stunning !